The thumb is inspired by the front of The Queen's dress. I started with a base of OPI Alpine Snow. 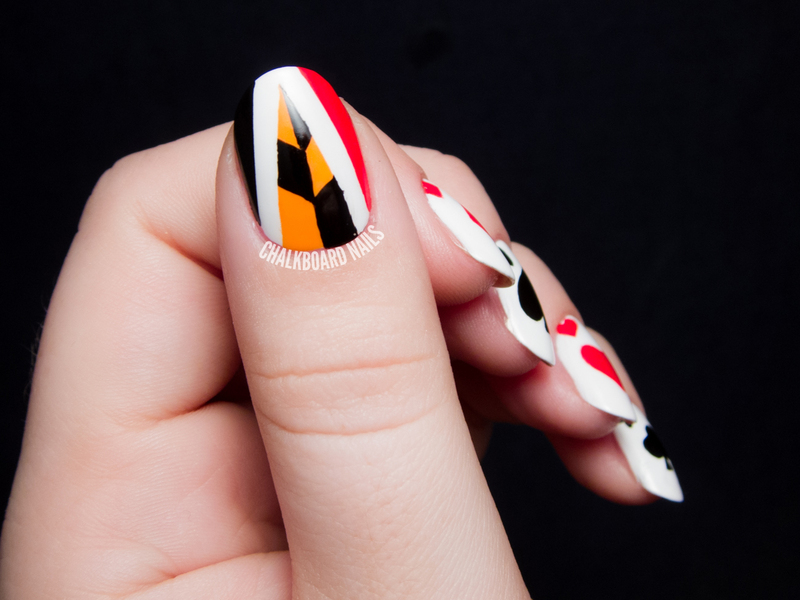 Once that had dried completely, I blocked off two large stripes stripes using straight Nail Vinyls. Then, I filled in the left side with American Apparel Hassid, the right side with OPI Coca Cola Red, and the center with OPI In My Back Pocket. I freehanded on the black details in the center with my nail art brush, and removed the vinyls to reveal the white stripes. 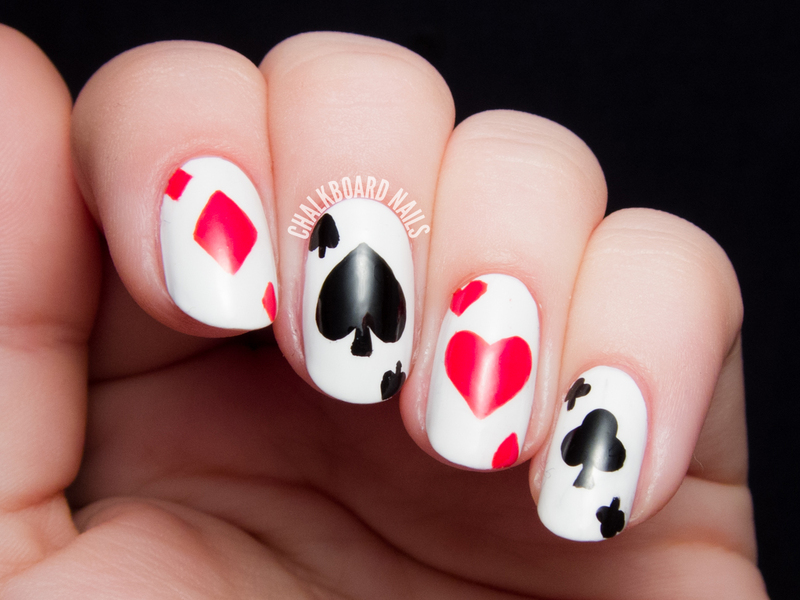 The playing card nails are inspired by her card guards, of course! 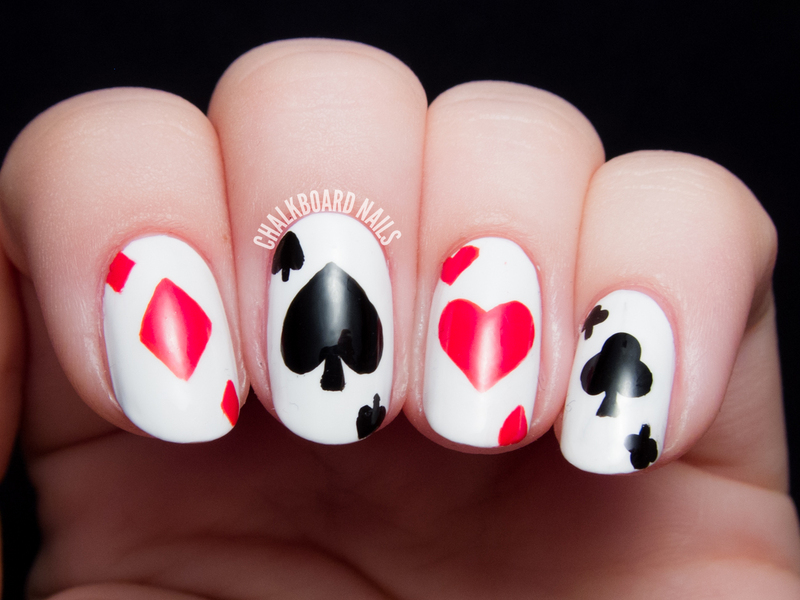 The heart and diamond cards were painted freehand with OPI Coca Cola Red, while the spade and club nails were done with American Apparel Hassid. The entire manicure is finished with a coat of Seche Vite. An added bonus... 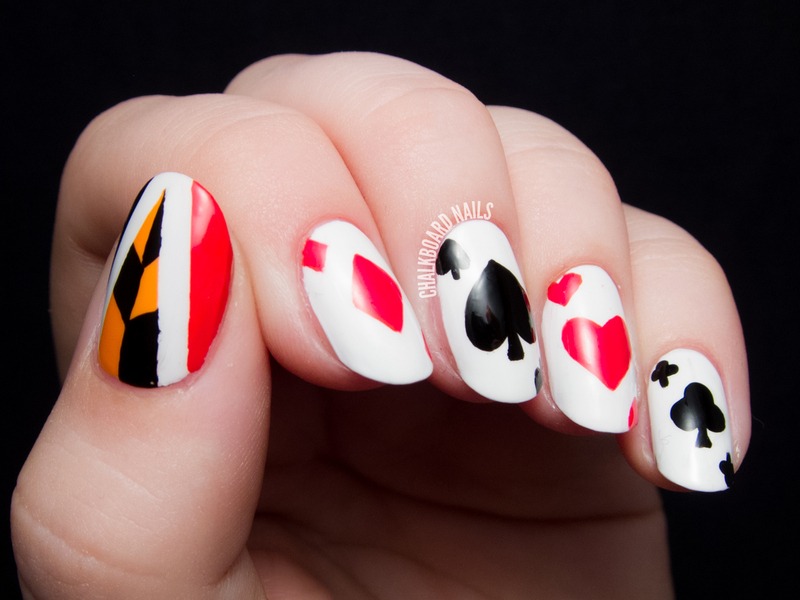 If you remove the thumb from this equation, you have a sweet Las Vegas playing card manicure! Who's your favorite Disney villain? There are so many great ones to choose from! These are awesome! I like how crisp the design is too. This is amazing! I'm so in love! I love it! 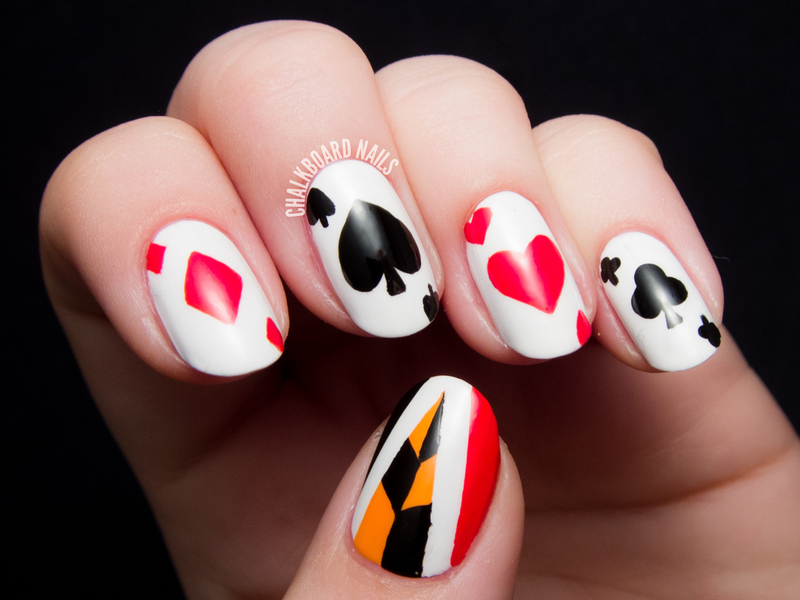 The spade is especially awesome. These are absolutely gorgeous! 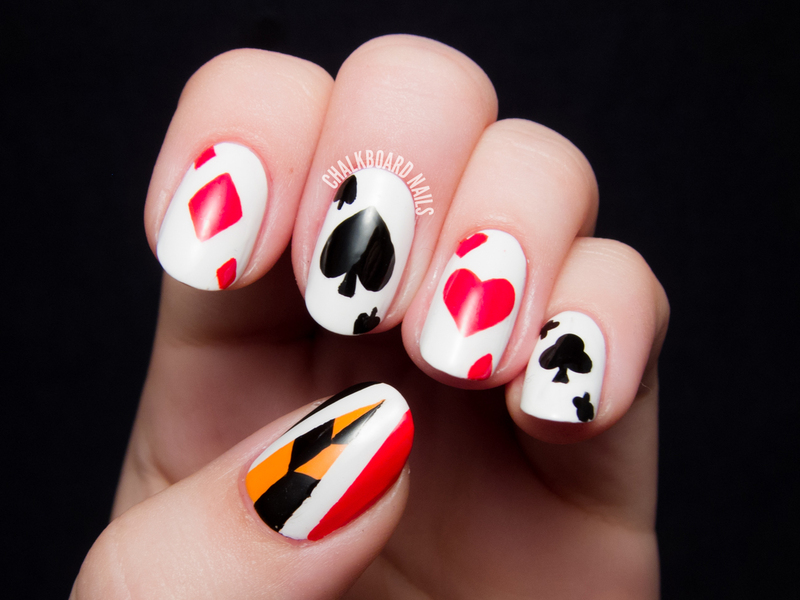 I love te Red Queen personally, so I'm a huge fan of these nails! These are so cute! I like the Red Queen, but my favorite has been Maleficent ever since I was a little girl. How fun - and perfect for Vegas!! Hey love you blog and all your posts!!!! for this one, my favorite villain is Ursula and thanks to your wonderful inspiration I might try it one day!!!!! Such a cool design, love the cards!